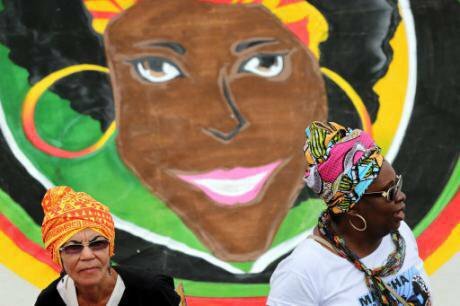 Two women join thousands of black women from across Brazil in a march to protest the violence and discrimination they say they suffer, in Brasilia, Brazil, Wednesday, Nov. 18, 2015. AP Photo/Eraldo Peres.In 2011, Harvard political scientist Archon Fung wrote that “many of us may soon turn our eyes to Latin America, and to Brazil in particular, to understand their accomplishments in democratic governance”. Focusing on mechanisms that enhanced the participation of citizens and civil society in the policy process, he concluded that as for “the vast range of ambitious and successful democratic reforms all over Brazil . . . there are simply no analogs of similar scale and depth in North America, Europe, Asia or Africa” . At that moment, Brazil was seen by many scholars as a laboratory of democratic experimentation with citizen participation and institutional innovation. Participatory budgeting, created by the Workers’ Party (Partido dos Trabalhadores) in Porto Alegre in 1989, was labeled a “best practice” by the United Nations in 1996 and was ranked among the world’s 40 best policy programs. In only a few years, this participatory institution became Brazil’s main “democratic export” and by 2015 had been adopted in over a thousand municipalities in more than 40 countries. After the Workers’ Party won the presidential election in 2002, participatory practices were adopted at the national level and on a large scale. An intense process of institutional innovation was underway, with existing institutions being reformed in order to make room for civil society organizations in the policy process. New institutional designs were put in place, giving citizens a voice and a role in the drafting of relevant policies. The creation of a national system of social participation was in motion, interconnecting participatory institutions designed to channel the needs and opinions of citizens at the municipal and state levels to the decision-making arenas in Brasília. The media never mentioned it, but millions of citizens participated in these new institutional channels between 2003 and 2016. In 2016 Brazil underwent an impeachment process, easily defined as a parliamentary coup, which overthrew the country’s first female president, Dilma Rousseff, and brought to power its unelected and historically most unpopular president, Michel Temer. The Workers’ Party has been substantively dismantled after a series of corruption charges that sent several of its leaders to jail after an obtuse judicial process that resembled a political crusade. With the opposition shattered, Brazil’s most conservative Congress ever has managed to overturn constitutional rights and further exclude workers, the elderly, women, and other disadvantaged groups. The picture is way too complex to be neatly summarized, and one question begs to be addressed: What has happened to all the institutional innovations that aimed at expanding citizen participation in Brazil? In order to address the above question, we will provide a brief look at the rise and fall of Brazil’s two main national-level participatory institutions, namely national policy councils and national policy conferences. National policy councils are participatory institutions that pre-exist Brazil’s 1988 Constitution, although they were expanded considerably, with some of their regional and local subsidiaries (state and municipal councils) spread across the federation, after that year. These bodies focus on individual policy areas and are allocated within the federal executive, many times linked to a ministry or national secretary. They meet regularly and allow civil society representatives to have a seat at the table together with state officials and public administrators. Depending on the national council, their role may comprise setting the government agenda, formulating policies and drafting national plans, enacting normative resolutions or advisory recommendations, devising strategies and guidelines for the implementation of national policies at the state and local levels, and monitoring and overseeing the execution of these policies. National councils have also brought the practice of lobby and advocacy to another level, as many of them designated special commissions to work with and within the legislature to advance their agendas and see bills enacted or rejected according to the preferences of the social groups affected by the policies. After Lula took over the presidency of the country in 2003, national councils were strongly empowered, expanded, and redesigned. A total of 17 existing national councils were reengineered, with their capacities expanded and their aims redefined, along with further inclusion of civil society actors and an increased role in the policy process. Among the more recently remodeled national councils are those concerned with policies on health, social assistance, science and technology, and rural development. In addition, 22 new national councils had been created by 2010, for example those in charge of policies related to food and nutrition security, social and economic development, cities, public security, and the promotion of racial equality. Several of the newly created or freshly reshaped councils targeted policies addressing specific minority groups, such as women, indigenous people, youth, the elderly, and people with disabilities. The inclusion of historically underrepresented groups in the policy process alone is a notable accomplishment from that period of intense institutional innovation. The presence of women voicing the demands of other women in the National Council on Women's Rights, for example, led to remarkable outcomes such as the groundbreaking Maria da Penha Law concerning domestic violence. Likewise, several historically excluded ethnic groups who participated in the National Council for the Promotion of Racial Equality contributed to the formulation of the Statute of Racial Equality, a law against racial discrimination and racial inequality. Brazil’s national policy conferences follow a similar trajectory. They are not new but were slowly put in motion after the 1988 Constitution, then entirely redesigned and expanded from 2003 onward. National conferences are multi-level deliberative processes that gather together ordinary citizens, civil society organizations, private stakeholders, elected representatives, public administrators, and other social and political actors. Organized by the executive branch with the aim of collecting input for the drafting of national policies, national conferences are structured around specific policy areas. They are open to participation at the local level, where delegates are elected to join state-level conferences and, from there on, the national one. This final stage brings together delegates from the previous stages and comprises the deliberation of proposals that have been scaled up from the preceding levels. The process concludes with the drafting of a final set of policy recommendations. Between 2003 and 2010 an average of 10 national conferences took place every year in Brazil, which means that thousands of municipal conferences took place at the local level and hundreds at the state level. Roughly five million people are estimated to have participated in the 73 multi-level processes organized during that period. The first National Conference on Public Security alone, held in 2009, engaged a total of 524,461 people, of which 225,395 participated face-to-face and 256,598 online. More consolidated policy areas like health and social assistance were deliberated in even larger processes. In 2011, the National Conference on Health gathered together 600,000 people from all over the country, while the National Conference on Social Assistance engaged about 400,000 participants in hundreds of municipalities. Such massive participation had an impressive impact on the way policies were formulated and decided in Brazil during that period. Over 40 policy areas benefited from these multi-level deliberative processes, many of which were later addressed by comprehensive national policies and programs for the first time, such as, for example, those related to food and nutrition security. Just like with national councils, minority groups also found in national conferences an important channel for making themselves present and heard in the policy process. About one fourth of all national conferences that took place between 1988 and 2009 dealt exclusively with minority groups, including policies for women, youth, indigenous groups, and the lesbian, gay, bisexual, and transgender (LGBT) community. The impact of national conferences on both executive and legislative policies is remarkable. Entire new policy programs, such as the National Action Plan on Human Rights enacted in 2009, have been drafted by the executive branch drawing on proposals made at national conferences. Between 2003 and 2008 only, policy recommendations from national conferences were reflected in the legislature in a total of 2,233 bills, 163 constitutional amendments bills, 216 laws, and six constitutional amendments. Important constitutional amendments, such as those including the right to food among social rights and making youth a subject of rights, resulted from the joint work of national councils and national conferences. The latter set the legislative agenda in the most diverse areas. The 2010 National Conference on Education proposed that 50% of revenues originating from the exploitation of the pre-salt layer were to be invested in professional and higher education. Policy recommendations from the 2008 National Conference on Rural Development were reflected in the 2009 legislation that regulates the provision of food in schools. Innumerable additional examples abound. If one compares the activities of participatory institutions in Brazil during Lula’s (2003-2010) and Rousseff’s (2011-2016) presidencies, one can clearly see how their decline could already be foreseen before the latter’s impeachment. Rousseff was not as open and successful as Lula in dialoguing with social movements, and several civil society organizations felt left behind during her mandates. Some would also say that she was not as fond of participatory mechanisms as her predecessor and that she favored expertise over deliberation in policymaking. On the other hand, the pressures on Brazil’s first woman president were huge. The political theater that ended with her impeachment made it very hard for her to govern the country, and he political instability and fiscal adjustments were quickly reflected in participatory institutions. In late 2015 most of the previous national conferences on minority groups were ordered to convene in 2016 as a conjoint conference on human rights. This amalgamation of five different national conferences into a single one was one of the first signs that times were about to change. From there on the decline was quick. Since Michel Temer took over the presidency, the structure of what once was envisaged as a national system of social participation has been falling into pieces. The national councils have become a stage for clashes between civil society and the executive branch. In his second month in power, Temer removed from office all representatives elected by civil society to the National Council of Education. The National Council of Cities was emptied by means of a presidential decree from June 2017, which transfers all previous competencies of the council to the ministry and asserts that all council members should be appointed by the government alone. Among the cancelled council’s mandates is the convening of the National Conference of Cities. Another decree from April 2017 replaced the composition and role of the National Council for the Youth, which no longer can elect its own members. With the weakening of civil society participation in these councils, several of their representatives have renounced or simply abandoned their positions. As for the national conferences (or what is left from them), they have become a stage for opposition and resistance from civil society toward the new government. The only three national conferences that took place in 2016 had been planned long before and ended up being acts of protest against Rousseff's impeachment. In one of them, the National Conference on Technical Assistance and Rural Extension, participants protested against setbacks in rural policies carried out by Temer while still the interim president, in other words, before impeachment process had ended. Among his first measures in the presidency was the extinction of the Ministry of Agrarian Development, which in previous years had allowed the broad participation of civil society in the definition of rural policies. Of the few national conferences that remained scheduled to take place in 2017 and 2018, most have lost their social support. Instead of mobilizing and preparing for the deliberative process as they used to, civil society organizations are questioning the organization and legitimacy of national conferences and even refusing to participate in some of them. The most emblematic case is the National Conference on Education, which by law should take place every four years. Civil society organizations are not only refusing to participate in its 2018 edition, but they are also organizing an alternative national conference, the Popular National Conference on Education. This seems like a reasonable reaction after the government restricted the role of the national conference in shaping education policy and removed several historical organizations in the education sector from participatory institutions. While just a few years ago Brazil was a case study for political scientists interested in citizen participation and democratic innovations, it may now become an example of how fragile these innovations may be when democracy itself shows symptoms of weakness. With national councils emptied and national conferences frozen the entire participatory structure ensured in Brazil’s 1988 Constitution faces a threat and may be dismantled. The two main pillars on which institutional innovations in Brazil had been erected – extensive institutionalization and a strong civil society – have not been enough to prevent a functioning system of social participation being torn to shreds in little more than a year. While laws made participatory institutions mandatory, civil society remained strong enough not to participate in them when such institutions are no longer democratic. While civil society has been removed from participatory institutions, laws have not been enough to keep them empowered. Lessons must be learned – and urgently by neighboring Latin American countries that might follow a similar path, though certainty not so rapidly. Democratic innovations in Latin America has been mainly state-led. Where participation depends on governments, civil society can’t do much to redeem democracy from the flaws of elections and the bias of parties. Moreover, institutionalization may ensure that participatory innovations remain in place, but it can’t ensure that these innovations will always be democratic or legitimate. FUNG, Archon. Reinventing Democracy in Latin America. In Perspective on Politics, December 2011, p. 857 and 867-868. SINTOMER, Yves; HERZBERG, Carsten; ALLEGRETTI, Giovanni; and RÖCKE, Anja. Learning from the South: Participatory Budgeting Worldwide – an Invitation to Global Cooperation (Bonn: GIZ), 2010.